Along with the thrones, Napoleon ordered side-chairs and folding stools for his entourage. The story of Napoleon Bonaparte, his rise and eventual fall, are the stuff of legend. Born in the city of Ajaccio on the Mediterranean island of Corsica in 1769, he grew up during one of the most turbulent periods in French history. When he left the island, he swiftly rose through the ranks of the French Army where his reputation as an astute military leader quickly spread. In the chaos that followed the French Revolution, Napoleon managed to make some very clever choices and, in 1799, was appointed First Consul of France. Having subdued Austria and settled a Europe-wide peace treaty that cemented French power on the continent, he made himself consul-for-life in 1802. 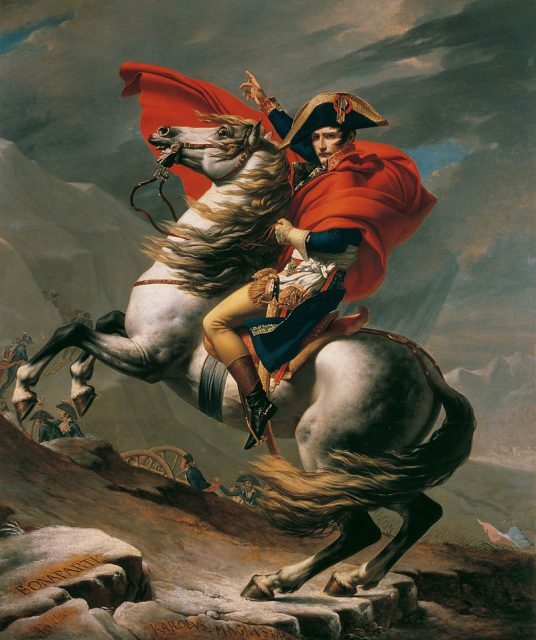 Napoleon Crossing the Alps painted by Jacques-Louis David. The horse in the painting is believed to be Marengo. Two years later, he became the First Emperor of France. His ambition and vision were certainly grand enough for the title, and he had a deep understanding of the way power and control could be maintained. To this end, he commissioned five Imperial thrones which were to grace the five centers of Imperial might: the Tuileries, the Palais Saint-Cloud, the Paris City Hall, and the two legislative assemblies. They were each a masterwork of cabinet-making and were decorated in gold leaf. 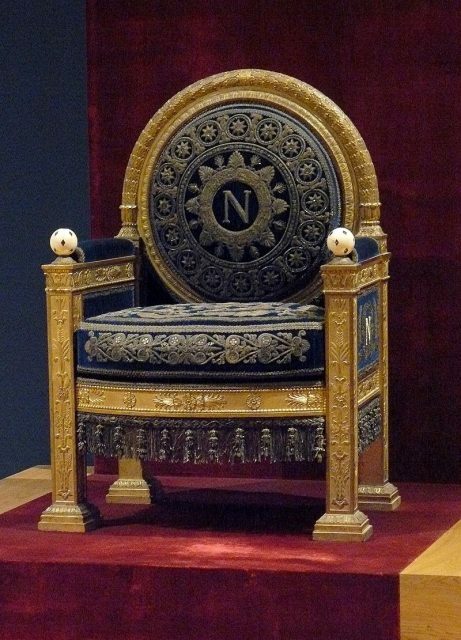 The one sold at the beginning of April is slightly smaller than the Tuileries Throne but also has the golden ‘N’ embroidered into the seat back. Osenat auctioneers sold the piece to an unknown bidder for $560,000 at Fontainebleau, France. It has featured in Imperial portraits and was used to assert Napoleon’s Imperial authority. The new Emperor was keen to impose a new neo-classic style on his reign to mark the dawn of a new European order that would break with traditional tastes associated with the deposed royal line. 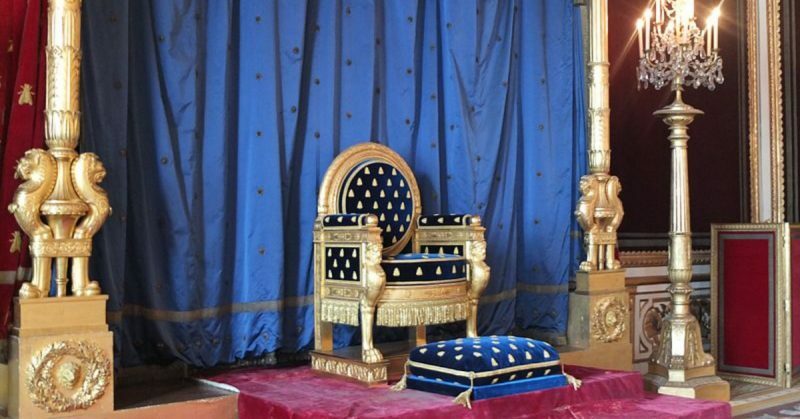 Along with the thrones, Napoleon ordered side-chairs and folding stools for his entourage. Only one of the side-chairs is known to still be in existence. 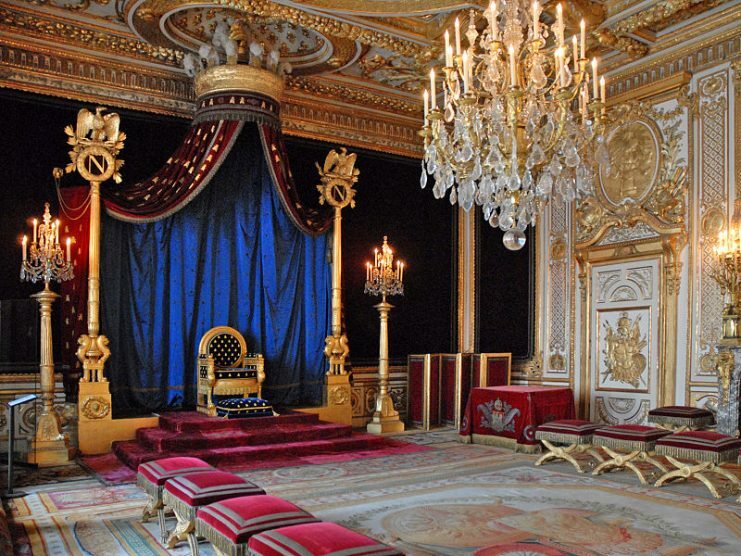 The furniture of the throne rooms has been recorded in detail by painters commissioned by Napoleon to document his reign. Julien Ingres’s celebrated work, Napoleon ler sur le trone Imperial, was painted in 1806. 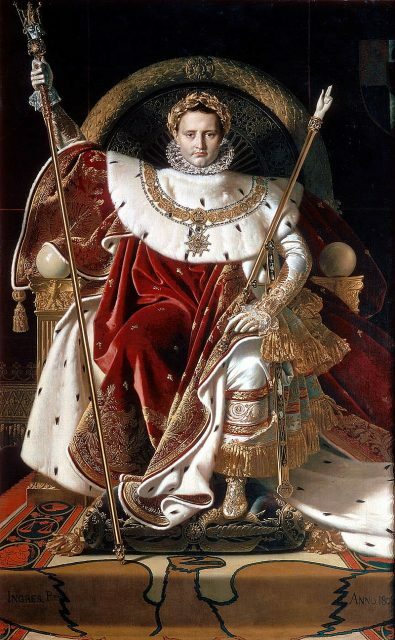 In the painting, Napoleon is wearing his coronation robes and holding items symbolic of Imperial power. The pose is based upon the statue of Zeus at Olympia and has been referenced as inspiration for similar portraits of monarchs and sovereigns. At its height, the Empire stretched from Spain to Naples across the Mediterranean and spread north to Sweden as well as controlling large swathes of Holland and Germany. The throne is of a normal size since the Emperor was, in fact, slightly taller than average. The idea that he was diminutive has persisted due to the relentless tide of anti-Imperial propaganda from his old foe Britain. After the fall of the Napoleonic Empire, many items from that time were removed, destroyed, or lost. Reminders of Imperial glory fell out of favor. As a result, Napoleonic collectibles cause quite a stir when they come to auction today. The throne was expected to make something in the region of $68,000 to $98,000, but for it to sell for many times that amount was still no surprise. The chair had been in the collection of the San Francisco Museum of Fine Arts for more than a century before the decision was made to sell it via Christies Auction House which coordinated the sale in Fontainebleau with Jean-Pierre Osenat. But Jean-Pierre Osenat disagreed, saying he had confidence in the experts commissioned to confirm the provenance of the throne. It would appear that the result of the sale would also weigh in the expert’s favor.